● Customers can choose to customize available sign templates or design their own custom sign using the site’s design tool. ● Tips and tricks for designing custom signs can help customers come up with the most appropriate signs for their particular needs. ● Customers can save on volume orders and get signs for as much as less than a dollar each. The bigger the volume of the order, the cheaper it gets. 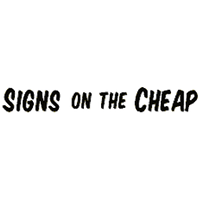 Signs on the Cheap is a retailer that offers a variety of sign products and options for a wide variety of interests. Through this online retailer, you can shop for contractor signs, political advertisement signs, real estate signs, business ad signs, and even bandit signs. You can purchase the signs in a variety of bulk amounts. In addition to this, you can take advantage of a variety of customization options. You can choose between sizes, styles, materials, quantities, design options, and more. You can also take advantage of the option to start from scratch, giving you a full measure of control over the kind of sign you are ultimately going to purchase. For most up to date offers check out Signs On The Cheap on Facebook and Twitter or and Twitter or contact Signs On The Cheap Support for any questions.